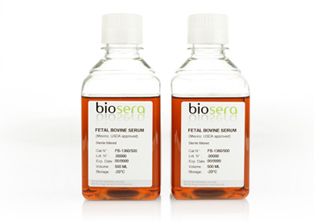 Close to important collection centers and with production unit certified, BIOSERA is one of the world’s leading suppliers of animal serum and cell culture media. Its customers in France and all over the world through a distribution network, trust on the quality of BIOSERA production who are ISO9001 and 13485 certified. With our global experience and dedication to cell culture products and serums, Biosera is the best choice for all customers looking for high quality products at reasonable prices. Our global advantage in the supply enables us to offer you a wide range of certified origins.ed origins. All over the world, laboratories rely on the high quality products produced by Biosera. With our international distribution network, we are able to offer the best service at the local level. Competitive prices, experience and first-class customer service make Biosera one less variable in your search.